satrix 1 year, 7 months ago. Android Nougat 7.1 ROM, Galaxy S4 Active Lineage OS 14.1 has now arrived via an UNOFFICIAL build. If you want some more Lineage ROMs or wanna taste the OFFICIAL Lineage build then stay tuned to the Lineage OS 14.1 ROM collection page. 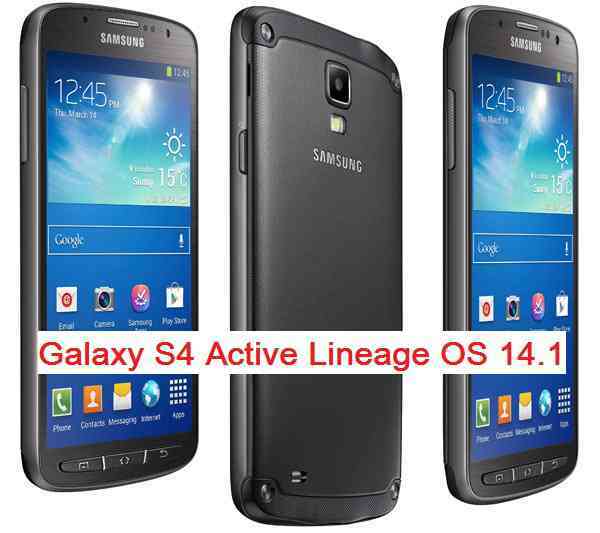 This Lineage OS 14.1 for Galaxy S4 Active (jactivelte) is brought to you by developer LuckyNuke1310. If you like this ROM then do consider a donation to LuckyNuke1310. THIS IS AN INITIAL BUILD WHICH MAY NOT BOOT AT ALL. HAVE A BACKUP BEFORE FLASHING THIS AND TRY AT YOUR OWN RISK. Installing a custom ROM on a Galaxy S4 Active (jactivelte) may require the bootloader to be unlocked, which may VOID your warranty and may delete all your data. Before proceeding further you may consider backup all data on the phone. You are the only person doing changes to your phone and I cannot be held responsible for the mistakes done by you. – Here is theTWRP update guide for the Galaxy S4 Active (jactivelte). This TWRP recovery guide requires an unlocked bootloader on the Galaxy S4 Active (jactivelte). Download and Copy the GApps and Galaxy S4 Active Lineage OS 14.1 ROM ZIP to your phone. First flash the Galaxy S4 Active Lineage OS 14.1 ROM ZIP from device. Then flash the GApps zip from your device memory. Reboot and Enjoy the Nougat 7.1 Lineage OS 14.1 ROM for Galaxy S4 Active (jactivelte). Copy the latest Galaxy S4 Active Lineage OS 14.1 ROM ZIP file to your phone. Stay tuned or Subscribe to the Galaxy S4 Active (jactivelte) forum For other Android Nougat ROMs, Lineage OS 14.1 ROMs, other ROMs and all other device specific topics. when is the official build coming out? It is upto the developer of this ROM to satisfy the guidelines of LineageOS OFFICIAL build, and then only it can get official Lineage OS updates. I am having problems unlocking my bootloader. It is stuck at “waiting for device”. “fastboot devices” does not show anything, ODIN does find the diveice though. Ive followed the linked tutorial for unlocking by the letter. Any advice? Please make this official as a official ROM. Everything works in my s4 active 4g .